Just two council by-elections were held on Thursday. Ollerton is in the marginal Tory constituency of Sherwood, which is one of Labour’s top targets at the general election. Note the appalling performance of the Liberal Democrats. There was better news here for the Lib Dems, as the result represented a 2.3% swing to them from the Tories. This should bode well at the general election for Kingston’s Lib Dem MP Ed Davey. 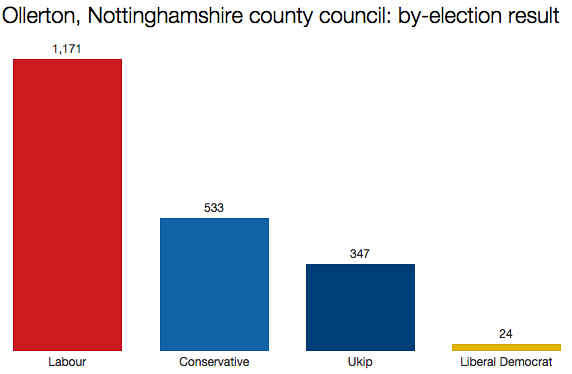 These were the last council by-elections of 2014. No more are scheduled to take place until 22 January. The Press Association has analysed 14 comparable results during December, and found a 1.1% projected Conservative nationwide lead over Labour. It’s the second month in a row the PA has put the Tories in front. But remember that for the Tories to be the largest party in parliament they need to be around six percentage points ahead of Labour, while for a majority they need to be around 10 points in front. A calculation based on five wards fought both times by all three major Westminster parties gives the line-up: Conservatives 36.5%, Labour 34.5%, Liberal Democrats 14%. Ukip averaged 23% in the 15 seats it fought in December, but its vote was down in this week’s two contests. 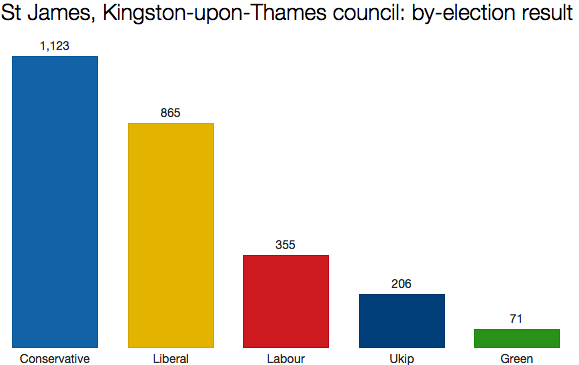 The party did particularly poorly in Kingston: a reminder that Ukip remains largely unpopular across London.